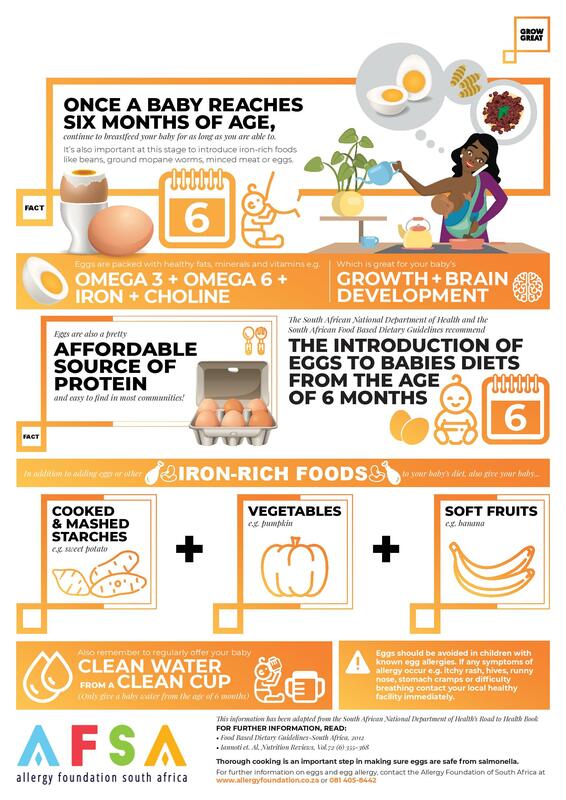 Grow Great has run a campaign which promotes the South African National Department of Health and the South African Food Based Dietary Guidelines recommendation of introducing eggs from 6 months of age as healthy and nutritious supplementary food. It is also important for health care professionals who treat infants to understand the rapidly evolving evidence surrounding early introduction of allergenic foods. Eggs are packed with healthy fats, minerals & vitamins e.g. Omega 3, Iron, Choline and Vitamin B’s that are great for a baby’s growth and brain development. Once a baby reaches six months of age, they encourage parents to continue to breastfeed their child for as long as possible. Egg allergy affects about 2% of infants and children and is most common in the first 3 years of life. If a child is already showing signs of allergies before 6 months, such as severe eczema, they may need to be assessed by a Paediatrician or Allergist before starting egg.